Garmin Connect may map your route. This tracks may be available for other people. But your device must have GPS. I don't want use GPS, but I like to share my tracks. I wrote programm for that. 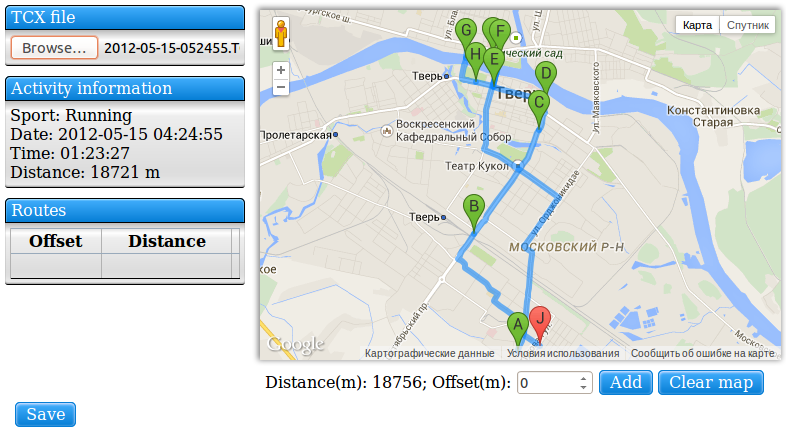 It adds GPS data of path, that I draw, to TCX-file. Then it is possible to upload this file to Garmin Connect. First upload your tcx-file. You see information about this training. Pay attention to the distance. Then you must draw route, that roughly corresponds distance of your training. Route should be longer than training. There is length of route under map. Two map services are available now: Google and Yandex. On Google maps you can choose starting point and direction. Two points are enough to draw shortest path. Google maps draw a road direction. So Google service is suitable for road bike trainings. On Yandex maps you can draw polyline. It is suitable for all trainings. Press "Add" to add route to training. It is possible to add more than one route. Press "Save" to save tcx-file with GPS data on disk.